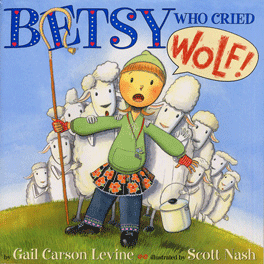 I have nothing against the moral of "The Boy Who Cried Wolf." If you lie constantly, people shouldn't believe you. Absolutely not. But it's the wrong moral for this story. The right moral, in my opinion, would be a lot longer. It would go, If you care about your sheep and tell somebody to watch them, and he proves two times in a row that he's not ready for the job, then you should fire him or keep checking whenever he hollers. Outrage at the fable and a silly idea started me writing. I thought, Wouldn't it be funny if a wolf and shepherd's pie were in a story together? Betsy is about as different from the Boy as can be. She would never cry wolf unless there was a wolf. Alas, she's pitted against the cleverest wolf on Rosenrise Mountain!